Its brilliant design and quality materials allow you to set it up in minutes yet it's tough enough to withstand harsh weather. An optional heated pad and door flaps help protect kitties from cold winter weather and give them a place to feel secure. Depending on their size, this house can hold 1 to 2 cats comfortably. With a series of hook and loop wall fasteners and a zip-on roof, we've made assembly of the K&H Outdoor Kitty House child's play. Our ingenious build and straightforward product directions will help you put together this cat house in a matter of minutes, all without any tools. There's nothing on the market that can match the features of the K&H Outdoor Kitty House! Why even consider building a cat house when this one can save you time, energy, and frustration? 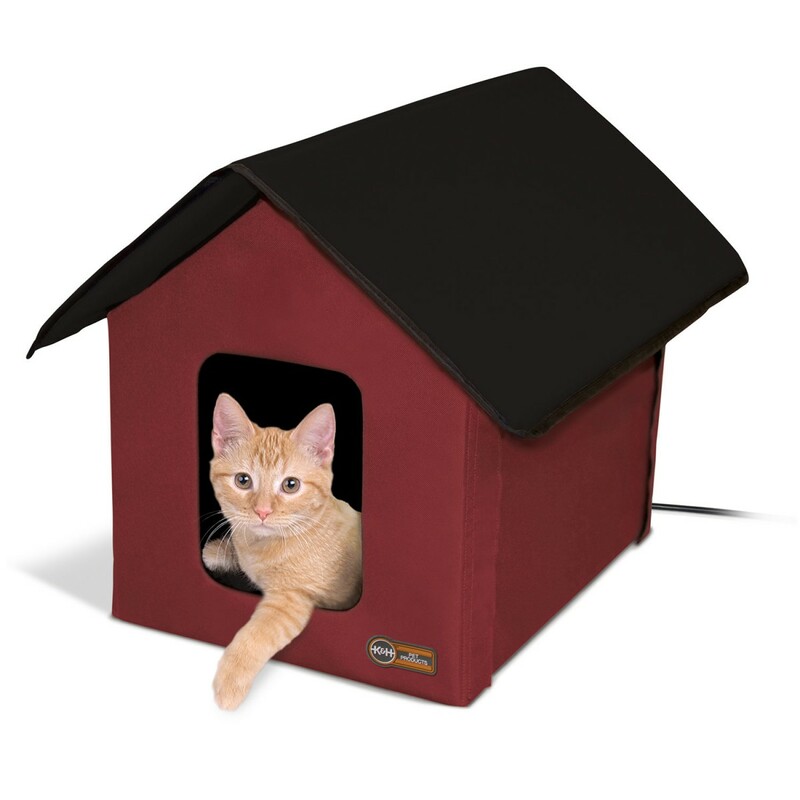 We offer a heated and unheated version of the K&H Outdoor Kitty House to meet the various needs of our customers. The heated model includes our small 14" x 18" Lectro-Soft Outdoor Heated Bed while the unheated model does not come with a bed. The patented Lectro-Soft is the market's only soft outdoor heated pet bed and made of a water-resistant PVC material. It features thermostatic controls, a washable fleece cover, a 5.5 foot cord, and an MET safety listing. Also included with the heated model are 2 door flaps. Hook and loop material is sewn above the doors of the heated model to simplify flap installation. While the Outdoor Kitty House is lightweight and easy to assemble, it's also strong. A unique design and water-resistant 600 denier nylon allow it to withstand snow and help protect cats from brutal winter weather. The zip-on roof hangs over the 2 doors to keep cats warm, safe and dry. Front and rear door door flaps on the heated model provide added shelter while allowing cats to enter and exit the house. These lightweight, clear flaps attach to the inside of the house and can be pushed open easily.